What the **** is this noise? Turbo? - Miata Turbo Forum - Boost cars, acquire cats. My GT2560R died a gruesome death by consuming a chunk of old hard rubber. Upon ingestion, the turbo suddenly developed a whine/siren sound. Turbo was rebuilt by Limit Engineering and reinstalled on the car. The car produces the *EXACT* same whine/siren sound with a completely rebuilt turbo and new compressor wheel. The sound develops at 5in/hg of vacuum, easily heard at 2in/hg, and gets louder as you build boost. The first video is what my car sounded like before the turbo failure. The second video is what my car sounded like just after the failure. The third video comparing the before and after rebuilding, and showing they are producing the same sound. The fourth video is what my car sounds like after testing the whole system thoroughly and fixing all boost leaks. BOV has been tested and performs perfectly. Sound is unaffected immediately after BOV releases pressure. No shaft play in turbo. Spins freely. No visible damage anywhere. It has been suggested that the compressor wheel could be rubbing the housing, but I can't see evidence of this and you cannot force contact by hand. Limit Engineering listed to the sound (through youtube videos) and said that it does not sound like the turbo, and the fact the sound is identical means that the turbo should be eliminated as the culprit. Intercooler has been completely removed and inspected for rubber and turbo bits. Nothing found. Limit Engineering said there was evidence of rubber splattered inside of the housing. A new air filter is arriving tomorrow to eliminate any chances of that causing the sound, but it is very unlikely. 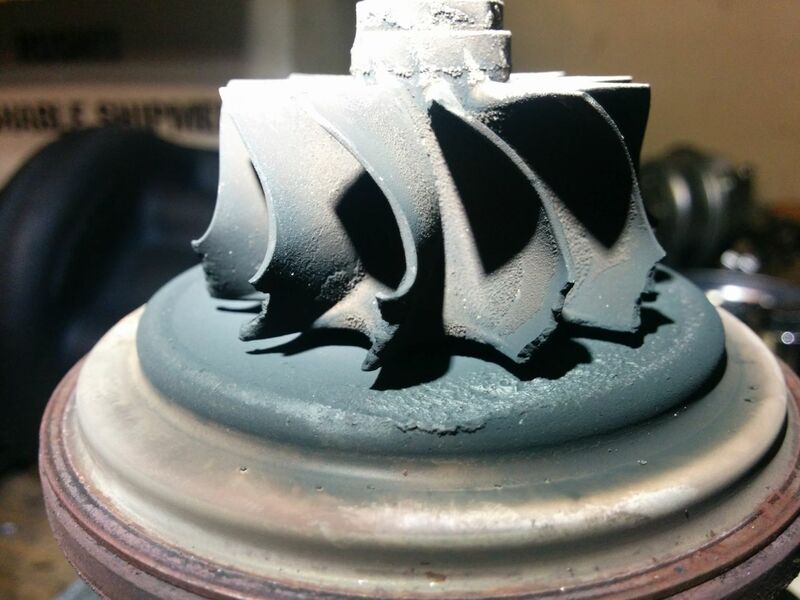 The filter has been in the car for a year, and did not suddenly change the same time the turbo ate a chunk of rubber. Have you checked your IC inlet to make sure there are no chunks of anything in there? Yes. Intercooler has been completely removed and inspected. No bits or chunks found. Limit Engineering found evidence of rubber splattered inside the housing, but that is all that was found. Does "rebuilt" mean actually rebuilt, or did they just swap the CHRA for a new one? Do the wheels look right? My 2560 started whining after I broke a throttle body screw and it went through the motor and trashed the turbine wheel. They rebuilt the whole turbo. Replaced the compressor wheel and bearing. Turbine wheel was perfect, so it was reused. New compressor wheel looks the same as the old one, minus the damage. The new turbo was installed, and then completely reinstalled again to redo the work. Sounded the same each time. Wasn't the turbo installed with loose bolts the first time. Turbine wheel could have gotten messed up when it was run with the loose chra bolts. Sounds like a boost leak to me. I'd test it to 30 PSI and find out if that's the cause. Did you apply 12 PSI to inlet of turbo, or apply pressure until your boost gauge showed 12PSI at the intake manifold? From video it seems TPS position dependent, not turbo shaft speed dependent. I agree it's not the turbo. Correct, most of the bolts were loose from the shop that installed it. One was still tight, and probably was the reason it survived ~20 miles of driving back home. Culry took the housings off and inspected each wheel and checked for shaft play. The wheels never made contact with the housings. Everything was perfect and reassembled. If the "shop" that rebuilt the turbo or installed it didn't tighten the bolts, I'd highly suspect they didn't do everything else right either. I'd go over everything very carefully. 12 PSI was the reading from the boost gauge at the intake manifold. I think I peaked at 13 PSI. The progressive build of the whine from 5in/hg to full boost makes me think its not a boost leak. But I am happy to check the system again to a higher pressure. I figured the sound is easiest to hear at 0-5psi before the exhaust overpowers the sound, so 12 was plenty sufficient for this test. I am going to try replacing the intercooler with a piece of PVC/ABS tube tonight to see if bypassing the intercooler solves it... Perhaps something funky is going on inside it after turbine bits passed through? Everything that "shop" has touched has been gone through and re-done. I feel good about the installation now, and just baffled by this sound that has started and maintained since the ingestion of rubber. The reason I asked about "rebuilt" is that, AIUI, Garrett "GT" BB turbos can't be rebuilt, at least, not in the sense that the previous sleeve bearing ones were. The rebuilds that most shops offer are actually a discounted CHRA swap. I think Limit Engineering is the Garrett-approved place for their turbos though, so maybe they're different. I don't know if the noise comes directly from the misshapen wheels, or if it's the result of an out-of-balance wheel having damaged the bearing and what you're hearing is the bearing. If the latter, then it's theoretically possible that they screwed up the replacement bearing when installing it or misbalanced the wheels or something. Ouch! My turbine is in good shape. I wouldn't try it without a pressurized oil supply on the bearing, either. I had a friend launch the car in second gear a few times while I ran along side it with the hood off. It was really hard to run, not trip and not get ran over by my own car, and simultaneously carefully listen to the sound, but I think I was able to differentiate the sound from the turbo. As the boost builds, the sound of the turbo violently and viciously sucking in air becomes deafening right next to the air filter, but the whining sound is not noticeably louder than when you sit in the cab of the car, or on a street corner 100+ feet away. Running along the driver side or passenger side revealed no perceivable difference in volume of the whine. This may be pointing to an issue like the intercooler making a funky sound, or something in the exhaust...? Perhaps the shaft is bent, and they reused it? That would cause a lot of vibration once it begins to spin up, and if was bent then and bent now, that would explain why it's making the same sound as before. If it's turbine-shaft related, then it will change pitch with the turbine RPM. Does it only do it under boost? Does it change if you run higher or lower boost targets? What if you run it up to 5000 RPM at part throttle and then stand on it? Interesting theory. I will call and ask Limit Engineering tomorrow if that is a possibility, and if/how they test turbos before shipping out. The siren/whine winds up and winds down, always. It seems siren volume is directly correlated to pressure of the intake upon accelerating. After the BOV releases pressure, you can hear the siren/whine wind down at the same gradual rate every time. Sound is the same at 0 psi at 3k rpm = 0 psi at 4k rpm = 0 psi at 5k rpm. Boost controller is currently eliminated. I am running base boost at the moment to reduce the number of potential sources... Vacuum hose is running directly from the compressor housing to the waste gate actuator. Don't judge: I left work late and it was dark, so I decided to try to listen to it again with a friends help instead of running to Lowes/Home Depot to buy pipe and installing it tonight. Secured the front wheels, lifted the rear wheels, and then revved the engine in second gear while playing with the parking brake. Poor man's drivability dyno. I let the rear wheels spin in second gear at idle between "pulls" to help cool the brakes. Anyways, with the car stationary and achieving 0 psi boost, I was able to walk around the car and listen to it at all angles. It really seems like the sound is coming through the intake. If you hear it wind down after lifting the throttle and opening the BOV, it's gotta be the turbine shaft, IMHO. You hear it through the intake because that's the most open path between the shaft and the free air. I would agree with this. Sounds like it's coming from the turbo, probably a bent shaft. Quick Reply: What the **** is this noise? Turbo?